If you love Chinese barbecue pork you are going to go crazy for this Crock Pot Pineapple Char Siu Pulled Pork recipe. 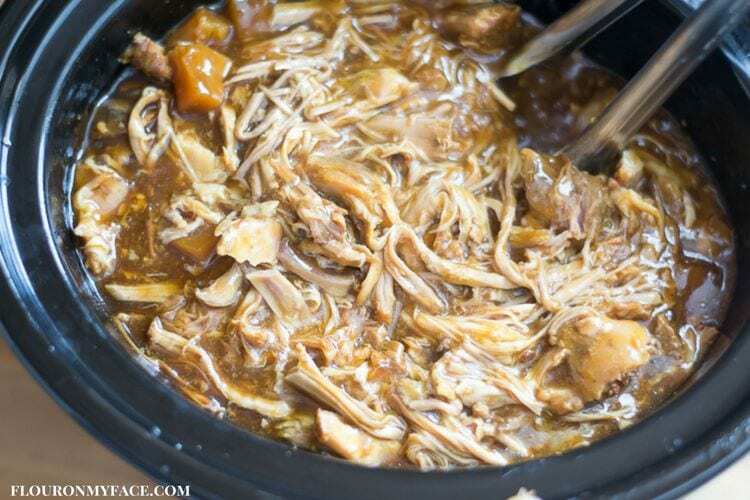 This crock pot recipe is an amazing pulled pork recipe! ! 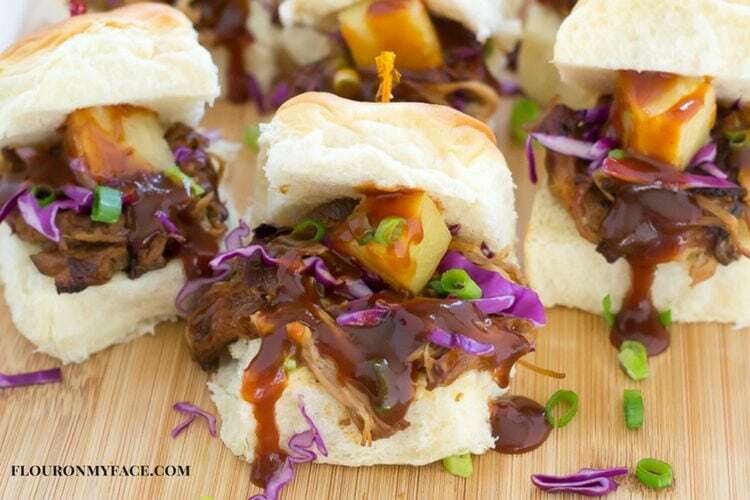 Char Siu Pulled Pork Sliders is a perfect game day recipe! 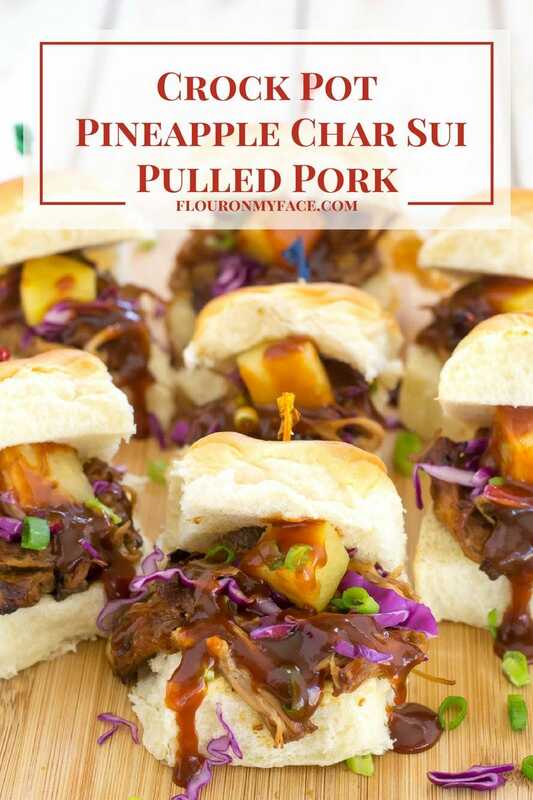 This time of the year it’s hard to pass up a delicious pulled pork slider recipe like this Crock Pot Pineapple Char Sui Pulled Pork, especially when you are planning a game day party for Super Bowl Sunday. Super Bowl Sunday is almost here and you are going to need some crowd-pleasing food on hand. This Pineapple Char Sui Pulled Pork recipe is so easy to make in a slow cooker. Something magical happens to a pork roast when you cook it in a slow cooker for 8+ hours. The pork meat turns into the tenderest piece of pork you will have ever eaten. It will melt in your mouth and have your taste buds going a gig. This Crock Pot Pineapple Char Siu Pulled Pork recipe calls for a tiny bit of Chinese Five Spice. If you can’t find any you could probably leave it out. It won’t be an authentic Char Sui Pork but the other ingredients have plenty of flavor. Remove the plastic and string net from the pork roast and place it into a 4 quart crock pot slow cooker. In a bowl mix the next 8 ingredients. Pour the sauce over the pork roast in the crock pot. Cook on low for 8-10 hours or 4-6 hours on high. Once the pork is cooked through and easily falls apart shred the pork either in the slow cooker or on a large baking sheet. To thicken the sauce mix the cornstarch and water. Add to the crock pot and increase heat to high. Continue cooking until the sauce has thickened, about an hour. To lightly brown the meat you can spread the pork over a cookie sheet and brown under the broiler, occasionally turn the meat to brown all sides. Can be served on Kings Hawaiian Slider buns or hamburger buns. Top each slider with a chunk of pineapple, sprinkle of chopped green onion, Asian Slaw and a drizzle of your favorite sweet barbecue sauce. Crock Pot Pineapple Char Siu Pulled Pork recipe. Sweet and tender pulled pork is an amazing pork recipe for sandwiches or sliders. Can be serve on Kings Hawaiian Slider buns or hamburger buns. For more Crock Pot recipes like this Crock Pot Pineapple Char Siu Pulled Pork recipe head over to my Crock Pot Recipe page. You’ll find over 200 Crock Pot recipes! Love using my slow cooker…and I love pulled pork. This is a crowd pleaser for sure. Great combo of flavours. These look so good Arlene! Plus I love that they are made in the slow cooker – so easy to make and very hands-off! I love my slow cooker Sarah! This looks absolutely delicious! Pulled pork is amazing… but I have never made it at home. I swear my mouth is watering! I definitely need to try this! Thanks Kirsten! Pulled pork of any type is delicious made in a crock pot. These sliders look so good! Pinned for an easy crockpot dinner! Arlene If I buy a slow cooker this year it will be to try your recipes. You always make them look so yummy!! Love this too! Veena you should definitely buy a slow cooker! They make life so much easier! This is how you win at hosting the Super Bowl! These sound delicious! Hi! I’m one of the co-hosts from the Welcome Home Wednesday link up. This recipe sounds melt in your mouth good! I pinned it so I can add it to my weekly menu in the next couple weeks. Thank you for sharing your post with us! Thanks for hosting and stopping by Leslie. Hope you enjoy the recipe! Yum! These sound delicious! Thanks for linking up with Merry Monday this week.